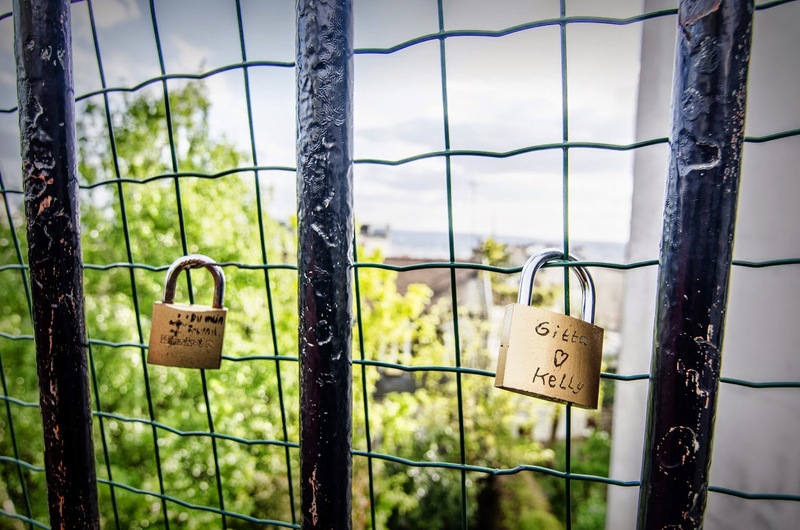 ParisDailyPhoto: The love lock disease is spreading! PS : if you understand French, I also encourage you to have a look at this interesting TV report. Have the local locksmiths get together and have a lock picking party. The smith that has the most locks after a set period of time gets free advertisement in the city. There has to be a divers school in Paris, same idea only with keys on the bottom of the river. Lovelock or not, I'd love to travel with a lot of love Inside my heart and see the same things with the same eyes for two ... Then, I can perfectly understand the lovelock symbol even if throwing the keys into the Seine might not be very indicated for the environment. I haven't thrown anything into the Seine yet I swear! But I won't say I will never ! Yes, it is becoming a plague on the senses. We have that happening here too on a footbridge. I wish they would make an art installation where you could do this without having to worry about making bridges crash into the Seine! :) I would love to do this, to leave a little piece there, but there should be a way to make it easy to do, safe for the residents, and not an eyesore on every bridge or fence! I like the first Anon's idea. But maybe it would be worth it to the city to invest in police patrols on the bridges. If people begin to realize they'll get arrested for this pollution, maybe they'll think twice. It is quite quaint and charming.....but if hundreds were to appear it would not be so! You captured the perfect scene, though, and it warmed my heart. I have returned after viewing the news video. Oh My! That is not so charming to see so many locks, and it is depressing to watch people throw the keys into the Seine. What is cute on a small scale becomes outright pollution (as Petrea noted) on the grand scale. It will be interesting to watch the outcome on this trend. It is moving to know that that many loving couples are circulating in Paris everyday. It's a problem, for sure! I was with Virginia when she took her photo. I took some too and posted mine recently here. I thought Bibi had a great solution in the comments (much like Christie's here today). Comes from people happy to be in the city & together. But I'll think about the place where I could lock mine one day, or one night, somewhere else... !